We are offering our clients’ an extensive range of Imported Filtration Products which is manufactured in accordance to the set industry standard. These are made of high quality raw materials that are procured from our well known suppliers of the industry. We design them with modern technology. These filtration products are used in various industrious for water, chemical and air filtration. These filter products are available in various sizes and models to suit every need of the user. Cellulose / polypropylene / polyester PTFE pleated membrane. Porous activated carbon / silver impregnated block. Porous plastic with granular activated carbon. Chloride, lead, bacteria, mercury removing cartridge. Micro fiber glass & polyester pleated. 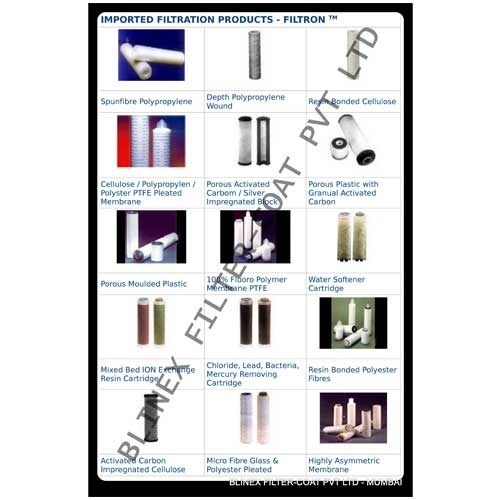 Looking for “Imported Filtration Products”?